There’s no doubting that last week’s meeting between first lady Michelle Obama and incoming first lady Melania Trump was awkward. Few details, beyond that they discussed what it’s like raising children in the White House, emerged from the high-profile rendezvous. Things were only made more awkward by reports, denied by the White House, that the customary photo op for the two first couples was canceled. Despite the official denial, no photo of the two couples ever materialized. But could the two have been saying more with what they wore than they said verbally? New York Times fashion critic Vanessa Friedman tried to decode the symbolism of each woman’s sartorial choices for the event, noting that Michelle Obama’s ensemble amounted to “a nice bit of color diplomacy.” The first lady wore a purple dress featuring an orange aftershock sunburst curve across the front that was designed by Narciso Rodriguez. The choice is significant for a couple of reasons, Friedman pointed out. 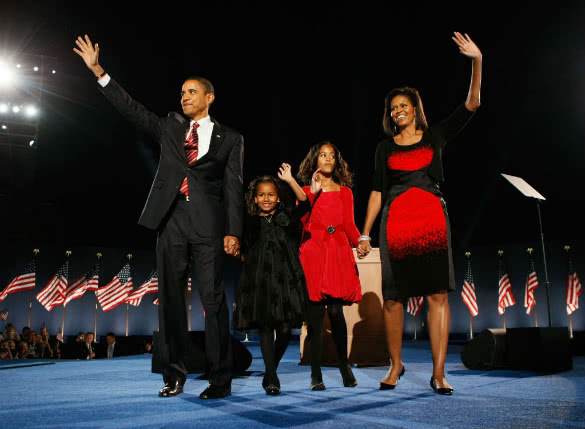 On the night her husband gave his victory speech after defeating John McCain in 2008, the black and red dress she wore for the occasion was also designed by Rodriguez. By wearing clothing designed by Rodriguez, Obama subtly called attention to his story — the Cuban-American son of immigrants who ascended to great success in America. The incoming first lady’s choice — a black sheath dress along with a black jacket and Christian Louboutin heels — was a bit of a contrast, Friedman noted, and a departure from her usual white and pastel colors. While some people took umbrage with Trump’s wardrobe choices for the meeting, Friedman thought it was hard to get a read on exactly what she was going for due to a major difference between the way she and Obama go about choosing their clothes.